Video Slot is an extension of the Reel type of slot machine. While the reel slot machines are confined to brick and mortar casinos, Video Slots are more related to the online gambling world. Nowadays, more and more online casinos are adding video slots to their game zones. This is because the video slots are innovative, great fun and extremely exciting. As a result, the manufacturers of these machines are going out of their way to make them extra entertaining and enticing. One way of doing this is to add more pay lines to the video slot machines. This enables you to make wagers per line so that you can effectively add to the amounts wagered on every spin. 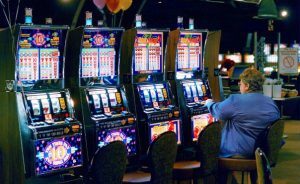 This means that video slots, particularly the ones employing fancy bonus screens requires more time for every spin than the conventional reel slot machines. ve coins played on every line, with a maximum wager of 45 coins. While playing video slot machines, you should consider the fact that most big jackpots on a lot of machines are paid only when you are betting the maximum number of coins. On an ordinary reel slot machine, the maximum is around four coins. However, on a video slot machine it will probably be anywhere between 45 and 90 coins. Big jackpots can be won only rarely, and playing to win these huge jackpots is not advisable. So the wise thing to do is to play a single coin per line rather than the maximum. By playing one coin at a time per line, it will be entertaining for you, thereby letting you stretch your possibly dwindling bankroll. So the question is whether you want to play the max number of coins in an effort to hit the jackpot or play one coin at a time just for fun and passing time. Whether you play video slots with a single coin or go all out for the maximum, you must not forget that playing slots need not be all that serious as the point behind the whole thing is good entertainment. It is good if you are lucky enough to win, however, on no account should you wager for sums that you cannot afford. Actually whole thing boils down to this – there is a hard and fast rule that you ought to follow and that is play full coins in what is known as a Progressive Machine. Suppose you have no full coins with you and happen to hit the right winning symbols, you won’t win the Jackpot. So it is wiser to wager full coins with the progressive machine all the time. There are various types of online slot machine games. The most basic of them are called Classic, Three Reel slots, Progressive and Fruit Machines. The games can be video slot versions of the conventional casino games or those inspired by computer games based on popular Hollywood action movies like Robocop.